Mohammad Bagher Ghalibaf (Persian: محمدباقر قالیباف‎, born 23 August 1961) is an Iranian conservative politician and former military officer who held office as the Mayor of Tehran from 2005 to 2017. Ghalibaf was formerly Iran's Chief of police from 2000 to 2005 and commander of Revolutionary Guards' Air Force from 1997 to 2000. He holds a Ph.D. in political geography from Tarbiat Modares University. He is also a pilot, certified to fly certain Airbus aircraft. He began his military career during the Iran–Iraq War in 1980. He became chief commander of Imam Reza Brigade in 1982 and was chief commander of Nasr Division from 1983 to 1984. After the end of the war, he became Managing-Director of Khatam al-Anbia, an engineering firm controlled by the Iranian Revolutionary Guard Corps and was appointed as commander of the IRGC Air Force in 1996 by Ali Khamenei. Four years later, he became chief of the Iranian Police Forces after the previous commander was dismissed following the 1999 student protests. He was also appointed as Representative of President Mohammad Khatami during a campaign to combat smuggling in 2002. In September 2005, he was elected as Tehran's mayor by the City Council of Tehran. He is also a professor at the University of Tehran. Ghalibaf is often regarded a perennial candidate in the presidential elections. He was a candidate in the 2013 presidential election but lost to Hassan Rouhani, in second place with 6,077,292 of the votes. He was also a candidate in the 2005 presidential election. He announced his run for a third time in the 2017 election. However, he withdrew on 15 May 2017 in favor of Ebrahim Raisi's candidacy. At the age of 19, he was one of the commanders of the defense forces during the Iran–Iraq War. Shortly afterwards he was named commander of the Rasulollah division. By the time he was twenty-two, he was already commander of the Nasr Troops. After the war he was selected as Deputy Commander of the Resistance Force and Basij Troops under General Afshar. Ghalibaf received the degree of Major General in 1996 after he had completed a master's degree in geopolitics. In 1998, when Mohsen Rezaei retired and Yahya Rahim Safavi took over as IRGC's new commander-in-chief, he was named Commander of Aerospace Force of the Islamic Revolutionary Guard Corps. Ghalibaf became one of the senior commanders of the Islamic Revolutionary Guard Corps (IRGC) in later years. In 1984, he was appointed head of the Khatam al-Anbia Construction Headquarters, which is the engineering arm of the IRGC. Under his management, the headquarters launched a 165-kilometer railway connecting Mashhad to Sarakhs. As commander of the Revolutionary Guards Air Force during the 1999 student protests, Ghalibaf was one of the 24 IRGC commanders who sent a threatening letter to the reformist president Mohammad Khatami stating that if the protests were allowed to continue, they would take matters into their own hands. Following the 1999 protests, he was appointed as chief of the Iranian Police Forces by the Supreme Leader of Iran, Ali Khamenei, to succeed General Hedayat Lotfian who was removed from his office during the violence. After becoming chief of police, Ghalibaf initiated some reforms in the forces, including dropping all lawsuits against newspapers, modernization of police equipment and the Police 110 project, which aimed to make the police more accessible to the general public. 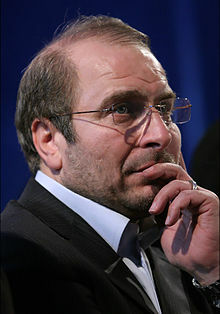 On 5 April 2005, Ghalibaf submitted his resignation from the military positions (including the police forces) due to his intention to run for the presidency of Iran. When Ghalibaf lost the 2005 election, he was proposed as Mayor of Tehran along with Mohammad Aliabadi and Mohammad-Ali Najafi. On 4 September 2005, he was elected as the next Mayor by the City Council of Tehran to succeed Mahmoud Ahmadinejad who left the office after being elected president. He received 8 out of 15 votes of the council. He was reelected for a second term on 2007 after receiving 12 votes with no opponent. According to Bloomberg, he has used his position as mayor "to foster a reputation as a politician who gets things done." Ghalibaf seek for reelection as Mayor of Tehran as the Conservative's choice in the 2013 local elections. His rivals were Mohsen Hashemi Rafsanjani, Masoumeh Ebtekar, Ali Nikzad and Mohsen Mehralizadeh. He was elected as Mayor for another term on 8 September 2013 after defeating Hashemi in a runoff with 51.6% of the votes. Ghalibaf was a candidate in the Iranian presidential election of 2005, and was being considered to be supported by some factions of the conservative alliance because of his popularity with both wings. However, in the final days before the election, the major support went to Mahmoud Ahmadinejad. Ghalibaf came fourth in the election. He made a populist appeal during the campaigns. On 13 October 2008, he announced his support for dialogue with the United States as suggested by President (then presidential candidate) Barack Obama. According to Ghalibaf, "the world community, the Iranian society and the US society would benefit" from such talks. “That's two things I still stand on and would seriously consider, first: the Constitution and second: respect the prisoners and detainees." He also set Love and Sacrifice and Jihadi Change as his official slogans. His candidacy was approved by the Guardian Council on 21 May 2013 along with seven other candidates. He was one of the opponents of Ali Akbar Hashemi Rafsanjani's candidacy and says it was better that Rafsanjani not enter the race, as he had served two terms before. He and two other candidates, Ali Akbar Velayati and Gholam-Ali Haddad-Adel, formed a coalition called "2+1". He was endorsed by former candidates, Alireza Ali Ahmadi and Sadeq Vaeez Zadeh. Ali Larijani, the current chairman of parliament, also supported Ghalibaf in the election. According to the Guardian, his moderating streak as Tehran's mayor is evident throughout Ghalibaf's political efforts. Ghalibaf received 6,077,292 votes (16.55%), putting him in second place behind winner Hassan Rouhani, who was elected as the new president. Hours after the announcement of the results, Ghalibaf published a statement congratulating Hassan Rouhani on his election as President of Iran and conceding. Ghalibaf is regarded the spiritual leader behind Progress and Justice Population of Islamic Iran and Iranian Islamic Freedom Party. He is a member of the political alliance Popular Front of Islamic Revolution Forces. Ghalibaf married Zahra Sadat Moshir in 1982 when he was twenty two years old. Moshir (born 1968) joined her husband as an adviser and head of Women's affairs in the Municipality of Tehran. ^ "تمام اطلاعات خانوادگی کاندیداهای ریاست جمهوری یازدهم". Isna. 13 January 2014. ^ Middle East Correspondent, City Mayors'. "Mohammad Baqer Ghalibaf Mayor of Tehran". ^ "Life (زندگی)". Official Website (in Persian). Archived from the original on 17 December 2007. Retrieved 8 August 2007. ^ "Mohammad Baqer Ghalibaf – Mayor of Tehran". City Mayors. 22 January 2008. Retrieved 17 December 2008. ^ Scott Macleod; Nahid Siamdoust (13 August 2008). "Mohammed-Baqer Qalibaf: The Man to See". Time. Tehran. Retrieved 12 February 2013. ^ a b c Kazemzadeh, Masoud (2007). "Ahmadinejad's Foreign Policy". Comparative Studies of South Asia, Africa and the Middle East. 27 (2): 423–449. doi:10.1215/1089201x-2007-015. Retrieved 12 February 2013. ^ Profile: Mohammad Bagher Ghalibaf Archived 24 May 2013 at the Wayback Machine. Presstv.com (31 December 2014). Retrieved on 2015-10-25. ^ Mohammad Bagher Ghalibaf becomes Tehran's Mayor. Khabaronline.ir. Retrieved on 25 October 2015. ^ a b c d "Tehran Mayor to Run in Presidential Election". Fars News Agency. Tehran. 16 July 2012. Archived from the original on 13 August 2012. Retrieved 12 February 2013. ^ "Tehran mayor welcomes Obama's call for talks". Daily Star. Agence France-Presse. 18 October 2008. Retrieved 17 December 2008. ^ Iran election: why Tehran mayor's popularity may harm his chances. Guardian. Retrieved on 25 October 2015. ^ همسران نامزدها به چه کاری مشغول هستند؟. Farsnews.com. Retrieved 25 October 2015. Wikimedia Commons has media related to Mohammad Bagher Ghalibaf. "FT Interview: Mohammad-Baqer Qalibaf". Financial Times. 8 January 2008. Siamdoust, Nahid (18 March 2008). "A Rival for Iran's Ahmadinejad". TIME. Stockman, Farah (22 December 2008). "Iran election raises hope for change". The Boston Globe. Aspden, Rachel (8 January 2009). "Conservative in a leather jacket". New Statesman. UK.